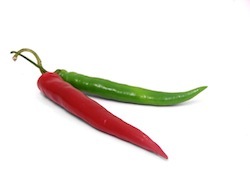 But a better reason to bring on the heat is because of capsaicin’s heart healthy and cancer-fighting effects. Research has shown that the compound can lower levels of “bad” LDL cholesterol and reduce plaque buildup in arteries. It has also been found to diminish the onset of prostate, lung and pancreatic cancers by increasing apoptosis, or cell death, in these cancer cells. Studies are only preliminary and have not yet been conducted on humans, but give good reason for those who can enjoy spicy foods to keep the heat in their meals. Another benefit may be found in capsaicin’s ability increase metabolism and aid in weight loss. One study showed that rats fed a high fat diet plus capsaicin experienced less weight gain and less fat accumulation than rats who did not receive the compound. Another study used a “non spicy” synthetic version of capsaicin, DCT, in a study involving obese participants who were assigned to a very low calorie diet of 800 calories per day. Those receiving the DCT burned an extra daily 80 calories. Though the results were modest in this study, capsaicin may have a different effect on people following a regular diet because it also curbs appetite. With its ability to both raise body temperature and dampen appetite, this powerful antioxidant may result in decreased calorie intake throughout the course of the day which can ultimately lead to weight loss. Despite the common misconception that very spicy or pungent food should be avoided during breastfeeding, strong flavored foods will not cause indigestion or irritability in newborns. In fact, by exposing a baby to a wide variety of foods and flavors during pregnancy and breastfeeding, he or she may be more open to consuming a variety of foods during childhood- and perhaps be less of a “picky” eater. For pregnant women experiencing discomforts such as heartburn (a common side effect in the second and third trimesters of pregnancy) or morning sickness, it may be a good idea to stay away from spicy foods which are likely to exacerbate these conditions. If you’re not a fan of chili peppers, don’t despair, as many of the same benefits can be obtained from a milder compound, curcumin (compound curcumin). This is the component that gives the Indian spice, turmeric, its yellow color and has been shown to have anti-inflammatory effects similar to capsaicin’s. 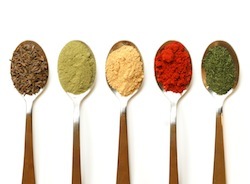 Try adding some to soups and stews for a nutrition-boost. From chronic disease prevention to a mood-boost, if you can take the heat, adding a little kick to your meals may be just what the doctor ordered!